After visiting several relative weddings recently, Son Hyewon, Division of Child Welfare & Studies '15, feels irked at the thought and sight of a wedding hall. She sees the need for a more challenging and slow-paced wedding ceremony. At the same time, she considers the wedding of the century in Korea, the wedding of Lee Nayoung and Won Bin. The couple opted for a simple wedding when the expectation by the public was a huge luxurious wedding with the couple bejeweled in multimillion wedding clothing. Backed by a recent trend to downsize, Son believes the public is now looking for a new wedding style and the essence of a wedding. According to research by Macromillembrainan and the outdoor brand Nepa on 1,000 people, Koreans' heart temperatures are now at minus 14 degrees Celsius. University students who are anxious about future due to the uncertainty of employment had the lowest heart temperatures; they averaged minus 24.2 degrees Celsius.1 Because of this finding resulted, the term ‘sampo generation’ rose above again. The term refers to people in their 20s and 30s who have given up on finding a partner, getting married, and having children because of societal pressure. These people face unemployment, skyrocketing housing prices, and rising living costs. Although they are called the ‘sampo generation,’ according to research from the Marriage Bureau, Gayoeon, a survey of 500 male and female university students revealed that only 6.0% of male respondents and 8.6% of female respondents said they had no intention to marry later in life.2 Hence, despite the lower rate of marriage in society, the survey clearly shows that most university students dream of marriage. In other words, university students who may be impacting the marriage rate at the moment are not giving up on marriage down the road. In modern Korean society, people vainly compare themselves to others and they assess others’ economic and social capabilities according to house size, location, and so on at the wedding ceremony. This trend caused people to have luxurious wedding, following in the steps of the wealthy. However, nowadays, in Korean society, people are looking to alternatives rather than keeping up with the social elite. In fact, the ‘small wedding’ phenomenon is booming. Small weddings reduce unnecessary processes, and since they are small, they do not require wedding planners so they are being called DIY Weddings. That is, the bride and groom participate in most of the wedding planning. The small wedding is also not a typical wedding, which usually only lasts about 30 minutes by boasting of scale of wedding. The small wedding lasts longer and guests at the wedding enjoy chit-chats over a delicious meal. Guests are generally only immediate family members and there is no planner or official MC. What has brought about this new wedding trend? The neologism, ‘wedding poor (honeymoon poor)’ refers to couples that start their lives together with huge debt because of the costs of a huge wedding. According to Duowed in its Wedding Cost Report, among the surveyed 485 males and 515 females who married within the past two years, their total wedding expenditures averaged 249,960,000 won while their per capita income averaged only 51,370,000 won, which meant Koreans spent roughly 20,000,000 won more than a person in the US would spend.3 In other words, Korea’s prolonged recession has hurt the younger generation greatly. They have a hard time finding a job and then incur more financial burdens trying to have a fine wedding. Hence, they are seeking alternatives to huge weddings in order not to be the wedding poor. In addition, the younger generation is consumer savvy; they pursue personal satisfaction and economical consume, so they are leading the new marriage trend. 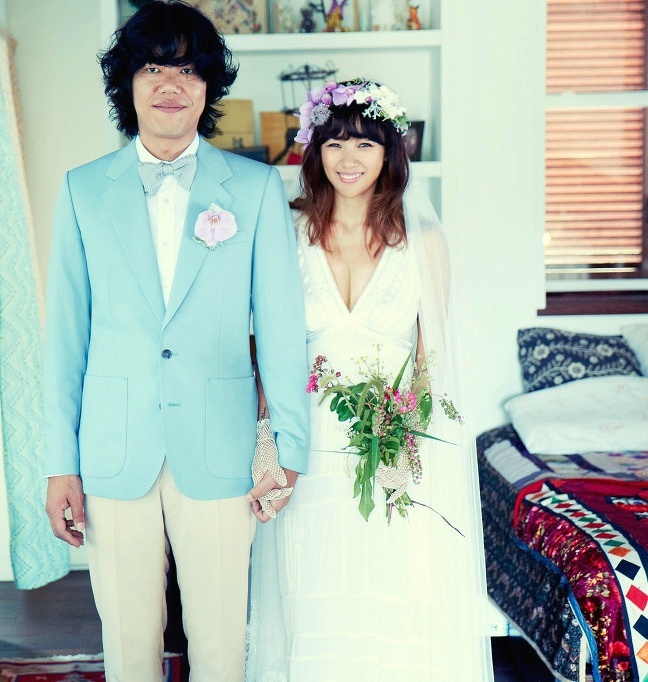 In 2013, celebrities Lee Hyori and Lee Sangsoon were married in a house on Jeju Island that was attended only by immediate family. They pioneered the way for the popularity of the small wedding. According to a 2013 survey on wedding costs from the Korea Consumer Agency, 85% of respondents said there is a tendency to have grand weddings. Following this, 21% of respondents said the tendency existed because of brain-washing. People were constantly exposed to the lavish weddings of the socially elite. Also, 28% said there was great pressure to have a wedding as spectacular as others.4 Accordingly, 49% of respondents believed the trend to have an extravagant wedding was due to contagiousness consumer sentiment. Therefore, top stars like Lee Hyori are breaking the old ways and bringing about a more upbeat wedding atmosphere and trend. The old awarness "Let's get married as magnificently as possible because we will only have a wedding ceremony once in our lifetime” has become "Let's get married in the most meaningful way as possible because we will only have one wedding ceremony in our lifetime." People’s perceptions have changed likely due to the influences of foreign cultures, which were brought into Korea by globalization and the increasing number of young people going overseas to study. According to a 2012 research from the Unesco Statistical Institute, the number of Chinese people studying in the United States totaled 235,000, the number of Indians, 95,000, and the number of Koreans was 70,627. Korea ranked third. However, considering the total population of each country, the rate of Koreans going overseas to study in 2012 was 7.8 times more than Chinese and 17.5 times higher than Indians. Therefore, it is only natural that their foreign land experience would affect their wedding attitudes. 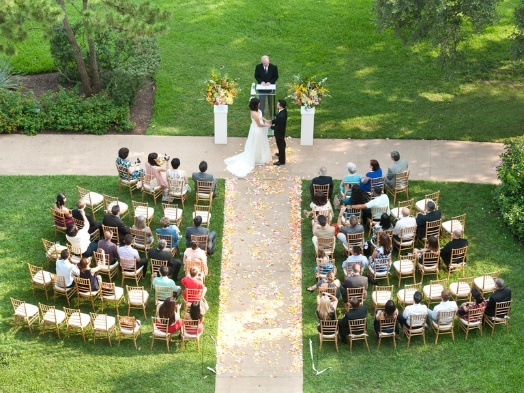 With a small wedding, the couple can reduce a great cost burden, so it is very economical. 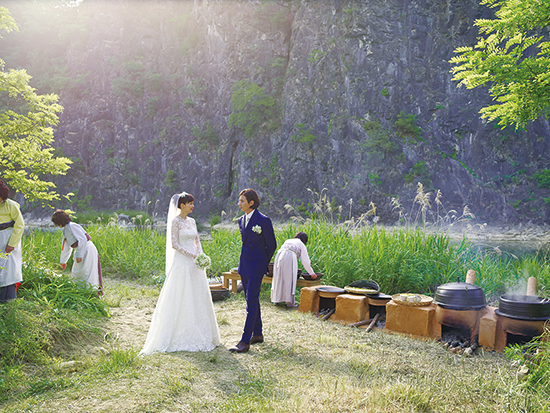 In the case of Won Bin and Lee Nayoung, they only spend 1,100,000 won on their wedding. This fact went viral on the internet for several months. How much would a couple expect to spend for a small wedding? According to the 2013 survey from the Korea Consumer Agency, the average wedding requires a budget of approximately 83,500,000 won. 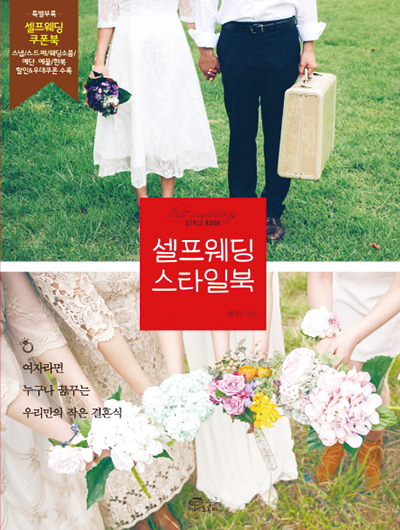 However, for a small wedding, the average cost is just 780,000 won. A whopping reduction of 75,700,000 won.5 The small wedding removes most of the wedding ceremony process, so it naturally reduces costs. Also, the couple is typically doing the arrangements; for instance, the couple avoids peak seasons and can opt for a wedding outdoors or at a café. The catering budget is also reduced due to the small number of guests. With all of the costs reduced, it is easy to save 75,700,000 won. Small weddings also help couples realize the true meaning of marriage; although people generally consider the wedding ceremony as commitment to each other, the modern glamour wedding is similar to a train station where people pass by each other in haste. Moreover, use of an MC makes the wedding look like an event not a blessed day. Guests also normally prepare wedding money envelopes that do not represent gifts from the heart and after eating lunch or dinner, they even forget the appearance of the married couple. However, at a small wedding, guests enjoy the true meaning of marriage by spending time with the newlywed couple and chit-chatting with close friends and family. Stars choosing to have small weddings considered the harm a typical Korean modern-day wedding can have on the essence of marriage as well as all the public attention that they would draw. A small wedding is not monotonous. It involves the couple’s individuality. Still, the biggest motivator for the small wedding is cost saving. However, with the money saved, the wedding can become much more individualised. For Kim Serom and star chef Lee Chanoh getting married in his restaurant was much like a special dinner gala party, and for actors Kim Muyeol and Yoon Seungah, their small wedding at outdoors will have long lasting memories. One couple even decided not to have a wedding ceremony, but instead eloped. They were singers Jung In and Jo Jungchi. They had a small unique wedding, which involved a climb up Mountain Jiri. These exemplary cases show how small weddings differ from large lavish wedding that are without distinctiveness. Benjamin Franklin said, “Marriage is the proper remedy. It is the most natural state of the man, and therefore the state in which you are most likely to find solid happiness.” If you are considering putting off married due to the costs involved, why not consider a small wedding? However, if you do opt for a small wedding, you must also consider the weaknesses of a small wedding. The major disadvantage is that you will need to do most of the wedding planning on your own. Also, because marriage is not a union between a man and a woman but a union of two families, you will need to consider traditional Korean sentiments. For Korean parents, marriage is the event that signifies the end to all their hard effort in raising and caring for you. 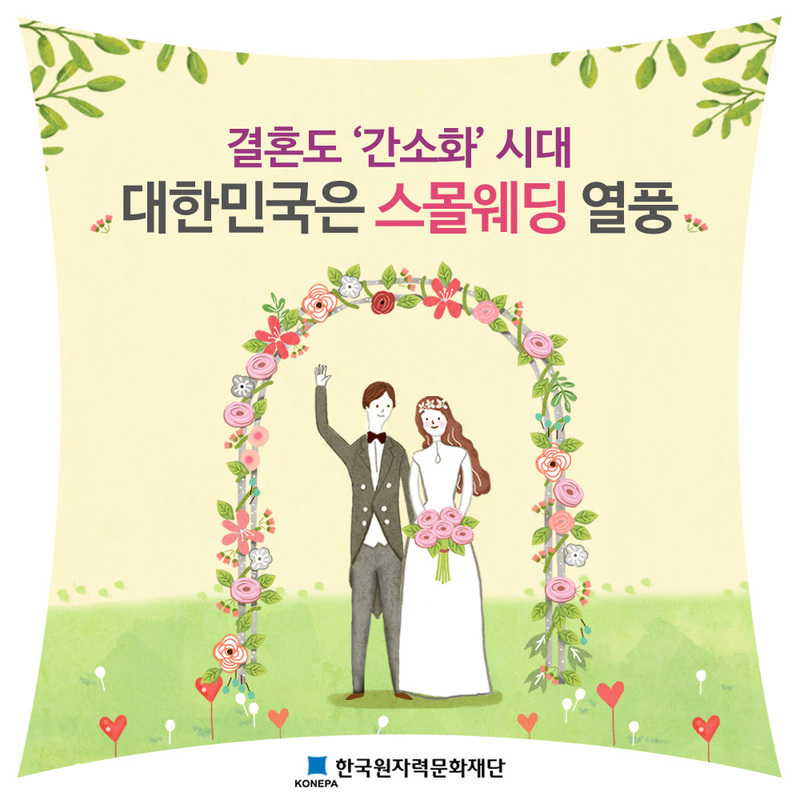 Therefore, a small wedding could be considered undutiful to Korean parents. Also, you should not jump on the bandwagon just because celebrities are doing it. You must first consider the meaning and purpose for a small wedding and the harmful affect. You need to choose the wedding style that best suits your needs and circumstances. Also, it is important to show your own personal uniqueness and traits at your wedding to make that happy memory last a lifetime because the ceremony signals the start of a new life.